Just when you thought it had all been done, Chef Paul Turano of Tryst Restaurant North of Boston in Arlington, MA has partnered with Quad Cycles, Verrill Farm and Walden Pond for another unique culinary experience. 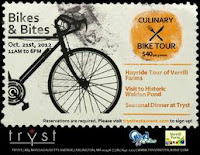 On Sunday, October 21st, 2012, those with a passion for food and adventure will experience the flavors of fall on Tryst’s Second Annual Culinary Bike Tour! This one-day excursion will highlight the best of local flavors as riders embark on a 35-mile bike ride, making stops at some of the best local food & wine purveyors including Verrill Farms in Concord, MA, historical Walden Pond in Concord, MA and finally Tryst in Arlington, MA. WHEN: Sunday, October 21st, 2012 from 11:00AM to approximately 6:00PM. WHERE: The tour will consist of 4 stops: Quad Cycles in Arlington, MA, Verrill Farm in Concord, MA, Walden Pond in Concord, MA and Tryst Restaurant in Arlington, MA. 5:00PM to 9:00PM: Group dines at Tryst in Arlington, MA. Time may vary depending on rider’s preference. COST: $40 per person. Cost includes tour and dessert at Verrill Farm, a historical experience at Walden Pond and dinner at Tryst. Additional $17 per person for bike and equipment rental from Quad Cycles. 0 Response to "Tryst’s Second Annual Culinary Bike Tour - 10/21"